The Galápagos Islands remain one of the most biodiverse spots on the planet—with tortoises, finches and iguanas dotting just 3,000 square miles of land. But the volcanic archipelago that once inspired Darwin is also home to nearly 30,000 people, not to mention the tens of thousands of tourists who visit each year. Those two forces have created a delicate balancing act, and a difficult question: How can residents live and flourish without wrecking the ecosystem that makes their islands so iconic? This past summer, University of Chicago scholars took a step toward figuring out what such a solution might look like. UChicago's Mansueto Institute for Urban Innovation, which produces ways to foster and support sustainable urban development, sent a research team to map the islands' capital city of Puerto Baquerizo Moreno. The UChicago team measured the shape and quality of the buildings using a combination of drone and satellite imagery, which they then converted into 3-D topographical models. They also created a detailed street-view map by strapping a GoPro camera to a bicycle helmet, enabling them to cover parts of the town that were inaccessible to cars. Collaborating with an architectural studio hosted by Universidad San Francisco de Quito, the UChicago researchers hope their new map will serve as a baseline for tracking how neighborhoods develop over time. Because construction in the Galápagos is often the result of individuals augmenting their own homes to cater to tourists, cities are growing with minimal organized engineering and urban planning. "People talk about sustainability in terms of climate change, urbanization or human development," said Prof. Luís Bettencourt, the Pritzker Director of the Mansueto Institute and a leading researcher in urban science and complex systems. "But these things need to happen together, and be understood in a way that creates outcomes which are good for both people and the environment." "We all want to live better in the future, which means there's going to be continued economic growth," he added. "Does that mean that we need to consume more in ways that are detrimental to ecosystems? That's the dilemma." Bettencourt knows the allure of the Galápagos well. Trained as a theoretical physicist, he remembers reading Darwin's The Voyage of the Beagle for the first time as a teenager. When Bettencourt first glimpsed several years ago the same bay that Darwin visited, he couldn't help but tear up. Bettencourt joined UChicago in February 2017 as the inaugural director of the Mansueto Institute. The following spring, the organization selected a pair of scholars to accompany him to the Galápagos for four weeks: Daniel Zünd—a postdoctoral fellow at the Institute—and Andrew Mao, who was then studying computational analysis at the Harris School of Public Policy. Universidad San Francisco de Quito and the Melbourne School of Design had already laid a foundation of research with the architectural studio started in 2015, combining architecture with data modeling systems to examine the built environment. What UChicago provided was technical expertise in computing and mapping, as well as a perspective on social sciences and policy research. Mao, AB'17, became the project's cyclist—a role that came with its own unique hazards. While collecting street-view images with the GoPro-outfitted helmet, he found that certain blocks were patrolled by several dogs. They didn't take well to interlopers. On one journey, a dog broke its leash, forcing Mao to use his bicycle as a shield. "You have to have a little bit of grit," said Mao, now a product analyst at PayPal. The Mansueto Institute researchers also encountered other obstacles. Internet service on the islands was often slow, forcing them to wait until residents and tourists had gone to sleep to upload photos and videos. Their drone also crashed toward the end of the trip after being carried off course by high winds. "The lucky thing is, that was really the last flight," Zünd said. Added Bettencourt: "There are fundamental constraints there, which allow you to see that technology is not a magic bullet. It enables you to do certain things, but you have to use it in the right ways." The UChicago scholars stored the street-view images on Mapillary, a crowd-sourced service for sharing geotagged photos. 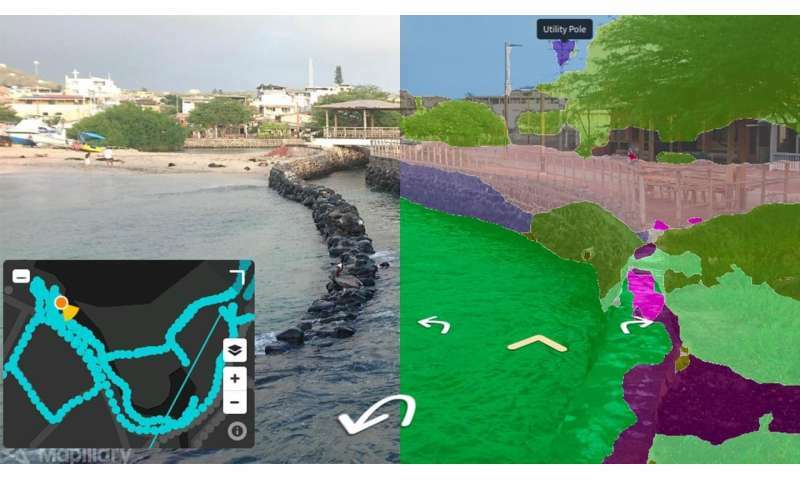 That software also identifies physical elements of the landscape, producing additional data layers for everything from water and vegetation to fences and trash cans. The studio's collaborating researchers recently published "Urban Galapagos: Transition to Sustainability in Complex Adaptive Systems," which provides a detailed framework for the unique challenges faced in the islands' ecosystems. The final chapter of the book, which Bettencourt authored, argues for a holistic systems view as an effective means of producing sustainable solutions. The work is far from over. The new map is rich in useful data, but will only lead to novel breakthroughs if researchers return to the Galápagos to see how streets and buildings have changed. From there, UChicago and its partners hope to continue working with local leaders, surveying residents to learn more about their living habits and empowering communities to be stewards of sustainable development. By taking an integrated systems approach—looking at environmental, physical, and social indicators together—the Mansueto Institute can create a more complete picture of the ecological and urban landscape. 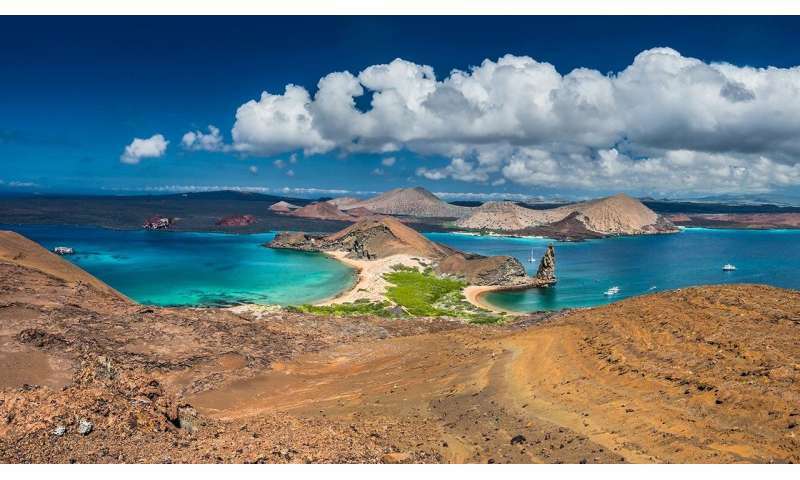 The Galápagos Islands represent a good starting point for this sort of research, offering a controlled environment in which to study the in-and-out flows of people, resources and other markers of human development. One reason? They are located nearly 600 miles from the nearest continental coastline. Designated as a UNESCO World Heritage site in 1978, the archipelago is home to nearly 30,000 people, and saw a nearly 40 percent increase in visitors from 2007 (161,000) to 2016 (225,000). Given that tourism is one of the best ways for residents to make a living, those numbers will only continue to rise. All of these factors only highlight the urgency of the Mansueto Institute's project. Change is happening rapidly in urban settlements all over the world. By utilizing technological innovations, data mining, and computational analysis, Mansueto Institute researchers aim to understand how development patterns on the Galápagos could lead to solutions for managing urbanization elsewhere. If scholars can work toward sustainability in an ecosystem as delicate as these islands, then there may be hope for other environments across the globe. "The Galápagos," Bettencourt said, "gives us a laboratory where that kind of thinking—that kind of action—is both necessary and possible."